One of the little discussed details surrounding the Passive House debate is the use and abuse of mechanical ventilation. The Passivhaus standard insists on it: other low energy standards are not so prescriptive. I believe that the way the new Code for Sustainable Homes standards have been drafted, the top levels more or less ape the Passivhaus standard and therefore mechanical ventilation with heat recovery will become de rigeur. The issue underlying all this is the ever-present contradiction between saving energy and maintaining good indoor air quality. You have to have fresh air inside a home and this fresh air has to be heated (or sometimes cooled) in order for it to remain comfortable indoors. However well you insulate the fabric of the structure, you still have this energy demand to deal with. The energy load naturally varies according to the outside conditions, but it can often be more than 1kW, sometimes even 2kW. That represents around half the overall heat load for the house. Now the Passive House approach is to first reduce the air leakage of the structure to an absolute minimum. This ensures that you don’t have to heat more air than you actually require. Then you run inlet and outlet ducts around the house and you draw in the fresh air via a heat exchanger, which pulls as much heat as possible out of the exhaust air. This is what is known as a Mechanical Ventilation System with Heat Recovery. The acronym we use in the UK is MVHR. These air-to-air heat exchangers have been getting more and more efficient over the years and some claim to recapture as much as 90% of the heat from the exhaust air. Also the electric fans that drive them have also been getting more efficient, thus further increasing the CoP (Coefficient of Performance). Even with a 90% recovery rate, you still need an additional heat source to keep the house warm, but not much. You have reduced the overall heat loss to a minimum. The structure doesn’t transmit much heat, the air leakage is all but eliminated and the supply air is pre-heated by the exhaust air. It’s technically very difficult to do much more than this and this is essentially why the Passivhaus standard is regarded so highly by our energy wonks. But there are health concerns that have yet to be fully addressed here. Whilst much of the world lives fairly happily with ducted air heating systems, they are not without their problems and issues. And the typical North American home, where this form of heating and air conditioning is the norm, is not built to anything like the airtightness specifications demanded by the Passivhaus standard. What will happen if you a) force people to build to really demanding air tightness levels and then b) force them to use mechanical systems to manage their air supply? We’ve seen a few thousand homes built to these exacting standards in Europe and as yet no one has reported any major problems with air quality. But the UK is proposing to roll out such standards on an unprecedented scale, albeit after 2016. Is this really practicable? Or even sensible? Take a look at this guidance, emanating from the Canada Mortgage and Housing Corporation recently, on what you need to do to keep your MVHR (which they refer to as HRV) systems tickety-boo. There is a surprisingly long list of maintenance issues to be attended to. Do you really think all UK homeowners will do this? And what will happen if (and when) they don’t? Your heat recovery ventilator (HRV) can help make your house a clean, healthy living environment, while keeping fuel bills down. But your HRV can't do all this without your help. First turn off the HRV and unplug it. Dirty or clogged filters can lower ventilation efficiency. Try to clean your filters at least every two months. Filters in most new HRVs can be easily removed, cleaned with a vacuum cleaner, then washed with mild soap and water before being replaced. Older units have replaceable filters. If your HRV is easily accessible, this is a 5 minute job. Remove leaves, waste paper or other obstructions that may be blocking the outside vents of your HRV. Without this vital airflow, your HRV won't function properly. During winter, clear any snow or frost buildup blocking outside vents. Check to see if your HRV has a condensate drain, a pipe or plastic tube coming out of the bottom. If it does, slowly pour about two litres of warm, clean water in the drain inside the HRV to make sure it's flowing freely. If there's a backup, clean the drain. 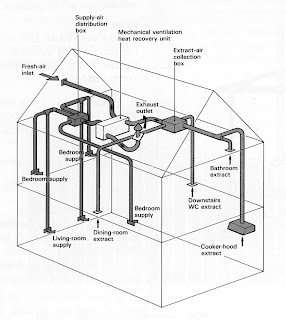 Check your HRV owner's manual for instructions on cleaning the heat exchange core. Vacuuming the core and washing it with soap and water will reduce dust which can build up inside the core. Remove the dirt that has accumulated on the blades by gently brushing them. Most new HRVs are designed to run continuously without lubrication, but older models require a few drops of proper motor lubricating oil in a designated oil intake. Check your manual for complete instructions. Your HRV should be serviced annually. If you are not comfortable doing it yourself, contact a technician accredited by the Heating, Refrigerating and Air Conditioning Institute of Canada. Make sure the technician you call has been trained by the manufacturer of your HRV. HRVs need to be balanced, with the fresh air flow matching the exhaust flow. If you do not know if the HRV was balanced when installed or if you have changed or added HRV ducts, you may want to check the balance with the following simple procedure. This rough test will take about 10 minutes. Use a large plastic leaf collection bag, typically 1.2m (48 in.) long. Untwist a wire coat hanger. Tape the wire to the mouth of the bag to keep it open. You now have a garbage bag flow tester. Go outside to where your HRV ducts exit the foundation. Crush the bag flat and hold the opening tightly over the exhaust hood. The air flowing out of the hood will inflate the bag. Time the inflation. If the bag inflates in eight seconds or more, go to Step 2. If the bag inflates in less than eight seconds, turn the HRV to a lower speed, and repeat the test. Then go to Step 2. Swing the bag to inflate it and hold the opening against the wall around the HRV supply hood. The air going into the HRV will now deflate the bag. Time the deflation. If your HRV is balanced, air going into the HRV will balance the air coming out of the HRV. The inflation and deflation times should be roughly equal. If you find that the bag inflates twice as fast as it deflates, for instance, your HRV is unbalanced. If you can see no problem with the filters that would cause such an imbalance, you should call a service person to test and adjust your HRV. Please don't ignore your HRV. Just a little bit of your time is all it takes to keep it running smoothly. — Turn dehumidistat (the adjustable control on many HRVs which activates the HRV according to relative humidity) to HIGH setting or to OFF. I have a ADM Indux MHVR unit, for which I need some spares. Anyone know where this firm now is (was in Bradford) or who took them over, if they are still in business. Why look at North America? They have been using this system for years in Sweden. Hi, like a previous correspondent, I have an ADM Indux unit, that was fitted in 1995. I've emailed Vent Axia''s service address, but no response as yet! Any ideas? Has anyone found spares or anyone that can service these things? We have a constant stream of black felt-like dust all over the house!! These systems have been routine in France for several decades, but they are unpopular because of the price (in fact most people install controlled extraction (compulsory) with no heat recovery). Also,the idiots who make the rules expect that the system provides the only inputs and outputs of air. For example, you have controlled extraction in the kitchen, which doesn't "know" about the hood for the cooker. I know it's a mortal sin in this field to discuss 2 things at once, but none of the systems I've seen do the obvious thing and take advantage of the heat that's available in the uninsulated loft space whenever the sun shines - probably about half of daylight hours during the heating season. I'd go further and ask whether it would be cost-effective to compress the exhaust air slightly in order to get an inexpensive heat pump effect (air cycle: frowned upon by thermodynamicists but probably OK bearing in mind the source temperature. Because of the increased temperature the return ducting could then be smaller and so less obtrusive, so the COP is not the only criterion. Conclusion: available products are primitive, and there seems to be little discussion of integrated inexpensive add-on systems that are the only solution in a situation where the "green" solutions don't remove the need for an expensive conventional heating system. Yes, why look at North America, They have been using this system for years in Sweden. This setup looks really fantastic. Though I'm afraid I might not have enough handyman skills to maintain it properly myself. Nice blog. Thanks for sharing this wonderful article. Thanks for your information, let create a awareness about Fume Extraction System Manufacturers Chennai to reduce the pollution.